Recycled paint: looks great & it’s cheaper than Dulux! 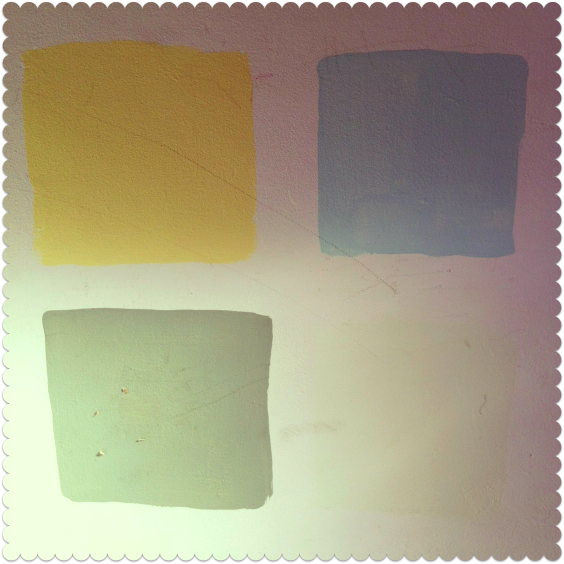 These four squares have been on my kitchen wall for a while now. My dithering over which shade to choose has had one advantage: Thrifty Baby’s recent decision to turn the wall into his easel, with some lovely dings and abstract pencil and crayon designs of his own didn’t bother me one iota. However the kitchen is the only room in our little house that hasn’t been redecorated since we moved in – and boy, does it need it. The skirting boards are almost the same yellow as the walls! Cut-price deals on paint can be hard to find. The DIY stores do occasional offers, but they are rarely anything to write home about. The economy-brand paints are so thin and watery, you need to pile on the coats – which rather ruins the point, doesn’t it? I just wish that paint pots weren’t so bloomin’ expensive. It also annoys me that paint is so hard to recycle. At my local household recycling centre, for example, they tell you to sling your half-used paint pots into the skip for landfill. That doesn’t sit well with me. As a result – and I am sure I am not alone here – I currently have a dozen half-empty pots in the shed, gently yellowing and rusting away. Fortunately, help is at hand in the shape of Newlife Paints, a company founded by a master chemist in Sussex. 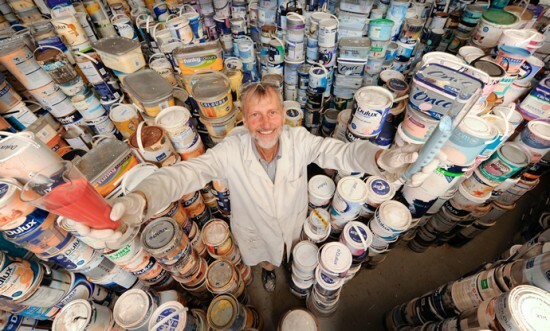 Keith Harrison, like me, was irked by the paintpot mountain piling up in his garage. Unlike me, however, Keith is an industrial chemist and was able to do something about it. He snapped on his safety goggles and developed a process to convert waste emulsion back to premium-quality paint. Blending, treating, testing, filtering and so on. For each batch of paint Newlife produces a pre-mix, which is checked in the company’s laboratory, before proceeding. Each batch is controlled and adjusted for VOCs (the solvents released into the air as the paint dries), opacity, density, pH, viscosity. Unwanted micro-organisms, which may have affected the original waste emulsion, are controlled and killed. Anyway, the results of Keith’s work are great: a range of interior and exterior paints in matt, silk and eggshell. A washable line called Dura, for kitchens and bathrooms. Thirty-two colours, as well as a full colour-matching service. And it’s good stuff, too. I was in touch with Newlife Paints a while ago because I heard about them and was interested to find out more (disclosure: Albert at Newlife Paints kindly sent me a few complimentary tester pots). Although I’m still at the dithering stage when it comes to my kitchen walls, I’m really impressed with the quality of the paint I have tried and would recommend it. It’s thick, goes on smoothly and there are some pretty colours available. Prices: these aren’t published on the Newlife Paints website, so you have to get in touch and ask. This is because a lot of the company’s business is trade – but my experience is that they are a friendly bunch there and are happy to supply to retail customers too. Alternatively you can go online and buy the Newlife Paints white matt emulsion here, for £21 for a big five-litre pot. By way of price comparison: the same quantity of trade vinyl matt emulsion from Dulux is £37.98 at B&Q. The Dulux Magic White Rich Matt Emulsion is £24.98. Since my samples arrived, Newlife Paints has also launched a designer range called REBORN, which you can buy online. REBORN has 28 shades along the lines of the fancypants Fired Earth and Farrow & Ball stuff. This paint costs £29 per 2.5 litre pot. By way of comparison, the 2.5 litre pots cost £38 each at Farrow & Ball and £49.50 (snort) at Fired Earth. Stockists: In addition to the REBORN site, the Newlife paints are available from Brewers and Covers trade supply stores in Sussex. Apparently the big five-litre tubs of white emulsion paint are now available from B&Q stores too, but they aren’t on the B&Q website yet so I can’t check the prices. However you can also contact Newlife Paints via their website, or Twitter, for more information about getting your pots in. This is such a great idea to recycle old paint and save the environment. I hope he does well with the venture. I just love things like this, when people take matters into their own hands and do something about it!! great initiative!! thank you so much for posting about this!! I have always tried to use every drop of my paint kettles, by mixing up new colours from my leftovers, or making them into chalk paint…etc…but I will definitely look out for new life pain next time I am in the need for some new supplies…. If you are in Cumbria, take a look at Impacts second hand furniture warehouse in Ulverston. A large decorating firm donates left over trade paint which Impact sells for the bargain price of 50p to £2 a tin. I know someone painted their whole house in the latest colours for £14. Everyone around the area buys from Impact but if anyone is in a difficult situation, let them know and they will save items/lower prices etc. What a great idea! 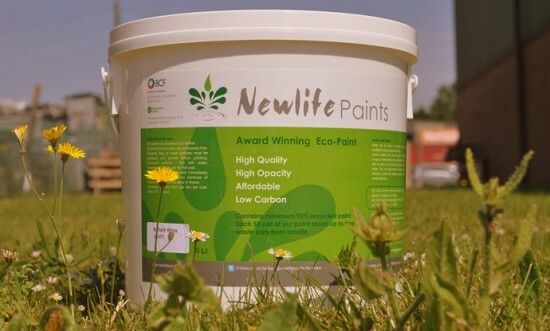 Seems like it’s going really well for Newlife paints- a nice gap in the market and all for good causes. Next time I’m painting there’s no way I’m buying Dulux! Nothing like this up here is S.Scotland, but what a stotting idea!! Sooner the better – everywhere! One of those ‘wish I’d thought of that!’ initiatives. This is a great idea! I can’t believe I hadn’t heard of it! The more we can recycle the better and as you say, paint has always been a bit of a nightmare. Great stuff!